The auto electronics industry is dynamic, exciting and changing rapidly, with new innovations hitting the shelves each year. It can be hard to know where to start when it comes to kitting out your truck, car or commercial vehicle with BLANK. Confused about the fast paced changes and the ever-changing number of options on the market? No problem – we have you covered! Read ahead for all of the information that you need when choosing auto electronics in Houston. Nowadays, ECUs are often modular, and include engine control modules (ECMs) or transmission control modules (TCMs). Believe it or not, a modern personal car or truck might have up to 100 ECUs, while a commercial vehicle may have around 40. It’s amazing how much tech goes into the make up of your car or truck! Most auto electronics can be classified by their different systems, and they usually fall into 5 main categories. We will discuss these categories in further depth below. How can you improve your driving experience with auto-electronics? There is always something new going on in the development of high-tech systems that are meant to improve driver experience – the number of new innovations has risen dramatically in recent years. All of the US’s major automotive businesses are capitalizing on the invention of electronic gadgets and gizmos that are meant to help improve the driver and passenger experience, as well as improving the over all performance of the car. This sector of the automotive field is expanding rapidly, with many companies vying to create the next ‘must-have innovation’ in automotive technology. The rise of technology within the automotive sector has expanded the market – it is not just the major car manufacturers in on the action any more! This is also all about current technological companies that are producing the latest products in the automotive industry. What’s in store for the future for auto electronics? Well, it seems like manufacturers and innovators will continually work to increase the safety of cars (including driverless and autonomous cars) as well as increasing connectivity and entertainment that will keep up with, and capitalize on, the very latest in smartphone technology. Want to make your car the vehicle of your dreams, able to meet your wants and needs? Vehicles are now full of auto electronic devices to help assist in passenger comfort, infotainment as well as the functional and necessary safety requirements. Here we discuss the different types of auto electronics that can be a great addition to your vehicle and heighten the enjoyment of driving. Put simply, auto electronics are any systems or devices that use electricity to be functional and that are to be used in a vehicle. Auto electronics first emerged out of the need to control the engine’s functions. The first branch of auto electronics was an Engine Control Unit. After discovering the uses of electronics within the engine functionality, the use of electronics in all aspects of a vehicle’s operation grew. As mentioned above, the rise of other electronic systems in cars means the term Engine Control Unit has now been transformed to Electronic Control Unit, as this covers more aspects of electronics in cars. Engine electronics – These can be used to measure fuel injection rate, and can control throttle and emission. Entertainment/Infotainment – This can vary with different manufacturers, but an entertainment ECU usually consists of a navigation system and screen, video capabilities, as well as an audio system that could include radio, CD player, portable music devices and smartphones. Active Safety – This is commonly linked to airbags, but safety can also come from hill descent control and emergency brake assist functions. Passenger comfort – The climate control and memory seats are commonly desired devices in consumer vehicles. Automated systems, such as windscreen wipers, headlamps and cooling options are also useful electronics when it comes to ensuring passenger comfort. Driver assistance – This type of electronic system can cover cruise control, blind spots, and lane and speed assistance options. 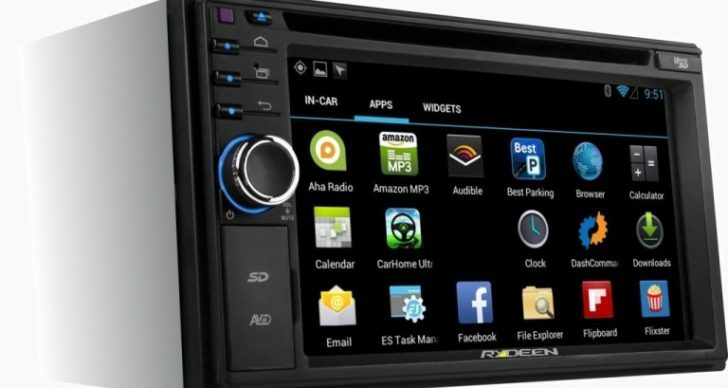 There are many different names for car audio and video devices – you might hear these referred to as infotainment systems, navigation systems and/ or information access systems. Depending on the manufacturer, these devices are called by different names and it’s important to note that their features can vary greatly. 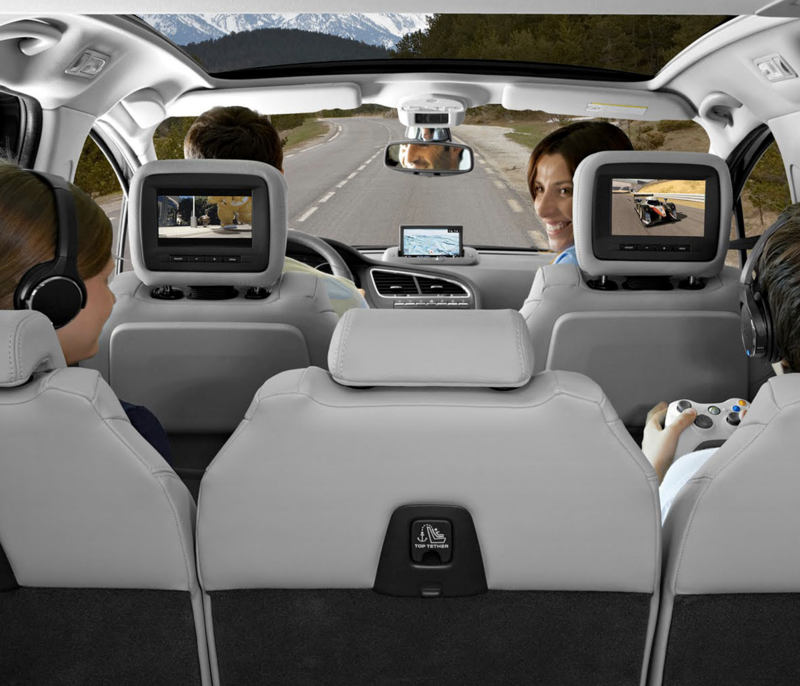 DVD entertainment system – Keep your entire family entertained and happy on long car rides. No matter which one you go with, car video systems usually have an interactive interface that is installed in your vehicle. You can control your system with this interface, or even use it when programmed in sync with your smart phone or tablet. Infotainment systems are becoming increasingly complex and are common in most new makes and models – they come with many features and drive to deliver the user as much information as possible. What brand should I go with for my car video, audio or infotainment system? There are many different manufacturers of car video, audio and infotainment systems – consumers now have more choices than ever. Here are some of the major players that you should consider when you are choosing your electronics for your car. Do you need more information? Not a problem at all – the skilled and friendly team here at Hurricane Auto is on hand to answer all of your questions and help you choose the best brand for your needs. Auto electronics leader Pioneer has a long standing of excellence in the industry, and they have developed a series of models called NEX (Networked Entertainment Experience). This range capitalizes on the growth of smartphone technology and is perfect for anyone who loves to integrate their devices. NEX enables users to interact with a powerful and innovative user interface that optimizes the user’s smartphone functions in a hands free, smart and intuitive way. The development team at Alpine has developed a high-specification car audio system. Their in-dashboard systems are designed specifically for your vehicle model in order to integrate seamlessly with your car’s interior. Alpine media systems hope to improve your user experience with a responsive and ground-breaking touchscreen. Kenwood have also taken car entertainment systems very seriously by developing navigation and multimedia systems that are in tune with your Apple or Android products. Kenwood partner with Garmin for a trustworthy and reliable navigation system while they also ensure a range of formats for all of your connected devices. Do you love music, podcasts, breaking news and international sports coverage? You need a satellite radio connection in your car! Satellite radio is another feature that many are keen to have installed in their vehicle. Satellite radio utilizes the satellites that are orbiting the Earth to broadcast radio stations from around the world. 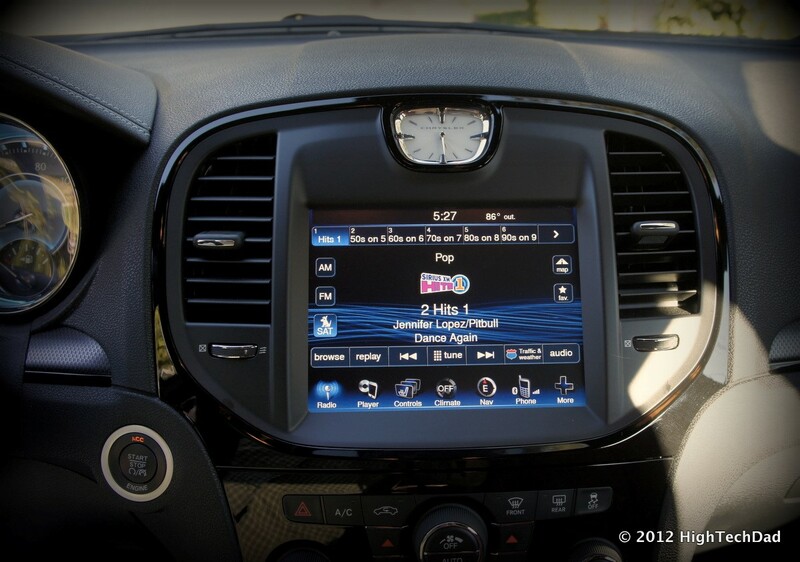 There are two licenses for satellite radio – Sirius and XM. With traditional radios, you can lose reception when you’ve driven too far away from a station, but with a satellite radio subscription you receive a signal no matter where you are. This means that you will never lose signal and you won’t ever need to change channels while you are driving from place to place. You’ll learn about new bands, stay on top of global news and never miss the score of the big game. Satellite Radio – Keep connected to music, news and sports without ever losing your signal. Car tracking devices are also growing in popularity as an auto electronic device. These devices use satellite signals to determine your car’s location. These devices can have a great many benefits – they can be used to recover stolen vehicles, and can therefore lower your insurance premiums. Car tracking devices can also be used by businesses to track fleets of vehicles or used as reassurance for elderly or young drivers to ensure they are safe and irrecoverable. Some of the big brands that manufacture car tracking devices include Viper, Excalibur and Carlink. These devices can be linked to your smartphone so you can locate your vehicle easily. Back up sensors are helpful tools that can help to prevent unfortunate accidents when reversing your vehicle. These sensors are particularly useful on large cars and trucks where visibility is poor. Back up sensors work by using radio or ultrasonic waves to reflect off the nearby objects. These sensors then emit a sound to let the driver know how far away they are from the object. Usually this sound is a beep, and the frequency of the beep increases the closer the vehicle gets to the object (or how quickly the waves are reflected off the object). This system can help boost the driver’s confidence in reversing vehicles, and they are often used by businesses to protect their fleets from accidental damage. Similar to car tracing devices, insurance companies will often reduce your premiums if your vehicle is fitted with back up sensors, as you are less likely to have a reversing accident with these helpful auto electronic devices. Consult with your insurance company and find out how you can save. back up sensors – Just a few of the components used in a power window installation kit. Back up camera systems are designed to give you a clear view of what is behind your vehicle so you can reverse with ease and without worry. Cameras are installed to the rear of the vehicle and are connected to a visual display in your vehicle (often an infotainment system of screen on the dashboard). These video cameras are designed to give you a clear and accurate view of what is behind you and are usually configured to switch on automatically when you set your vehicle to reverse. The camera is configured to flip the image horizontally to ensure the driver’s right and left is the same as what is seen on the screen. This mirrored image ensures that the orientation is consistent for the driver. This system is really useful when towing trailers, motorhomes or when driving a long vehicle or truck. Power windows are windows that will open or close electronically by using a switch rather than turning a crank handle manually to raise or lower your vehicle’s window. These are particularly useful when you have an older car or when you’ve purchased a lower specification car with plans to improve and enhance your vehicle gradually. Just a few of the components used in a power window installation kit. A Power Window Kit allows you to transform your existing manual windows to power-assisted windows so that you can activate your windows electronically. In these kits you can choose how many windows you would like to convert from manual to power activation. The most common kind of window kit is a universal window kit, which can be used on all vehicle types to create power windows. These kits are inserted inside the door panel so it does not change the exterior design or look untidy. Universal window kits can be used on all front and rear doors. Factory window kits use the original factory style regulators and motors to ensure consistency throughout your vehicle. To use a factory window kit you will have to get the specific kit to fit your vehicle model. When purchasing a window kit, it is possible to buy a full conversion kit, a lock kit or a switch kit. Talk to your local auto electronics specialist for help choosing the best option for your car; our team at Hurricane Auto in Houston is happy to help you choose which option is best for you. As well as converting your manual windows to power windows, a power window lock kit will also come with the accessories to create a central locking system on your car, allowing all doors to lock automatically when one door is locked. This feature gives you an added benefit of security as well as ease. 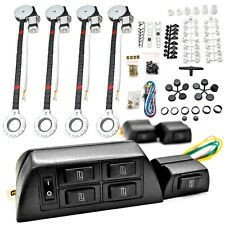 Power window switch kits allow you to choose your preferred set up of switches to ensure you have a car with features you are happy with. Many retailers will be happy to install these kits for you, as they require removing the door panel for installation and probably shouldn’t be attempted on one’s own. Are you excited about adding these features to your vehicle? We’re excited and happy to help. Leave us a comment below, or give us a call or email to arrange a consultation. Auto Electronics – Everything. . . Car Alarms – What do you need to . . . Your Complete Guide to Truck Access. . .
Auto Glass Replacement and repair &. . .